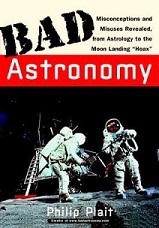 Bad Astronomy – written by Phillip Plait and published in 2002. The Blurb: Advance praise for Philip Plait’s Bad Astronomy “Bad Astronomy is just plain good! Philip Plait clears up every misconception on astronomy and space you never knew you suffered from.” –Stephen Maran, Author of Astronomy for Dummies and editor of The Astronomy and Astrophysics Encyclopaedia “Thank the cosmos for the bundle of star stuff named Philip Plait, who is the world’s leading consumer advocate for quality science in space and on Earth. This important contribution to science will rest firmly on my reference library shelf, ready for easy access the next time an astrologer calls.” –Dr. Michael Shermer, Publisher of Skeptic magazine, monthly columnist for Scientific American, and author of The Borderlands of Science “Philip Plait has given us a readable, erudite, informative, useful, and entertaining book. Bad Astronomy is Good Science. Very good science…” –James “The Amazing” Randi, President, James Randi Educational Foundation, and author of An Encyclopaedia of Claims, Frauds, and Hoaxes of the Occult and Supernatural “Bad Astronomy is a fun read. Plait is wonderfully witty and educational as he debunks the myths, legends, and ‘conspiracies that abound in our society. ‘The Truth Is Out There’ and it’s in this book. I loved it!” –Mike Mullane, Space Shuttle astronaut and author of Do Your Ears Pop in Space?